As part of the innate response to HIV infections, restriction factors are able to recognize viral components and, as a consequence, to directly block viral replication. In 2011, SAMHD1 came into the “virology limelight” for restricting HIV-1 infection in non-cycling myeloid cells (like macrophages and dendritic cells) and resting CD4+ T cells. Surprisingly, SAMHD1-mediated restriction could not be observed in non-synchronized (an important fact - as explained later), cycling cells. SAMHD1 expression alone is not enough to block HIV-1 replication: Indeed, CDK-mediated phosphorylation of residue T592 was subsequently identified to (solely) shut down SAMHD1’s restrictive activity in dividing cells1,2. As a consequence, we were interested in characterizing SAMHD1 phosphorylation at T592 during cell cycle-progression in yet more detail: In our study, we could show that T592 phosphorylation is present from S to G2/M phase, but is rapidly removed upon G1 entry. But which cellular phosphatase was responsible for this abrupt dephosphorylation? Initial mass spectrometry results pointed at PP2A, a ubiquitously expressed serine/ threonine phosphatase, but our first CoIP results aiming at confirming the interaction of PP2A with SAMHD1 were somewhat discouraging (well, to put it nicely). As chance would have it, my adviser Renate König was lucky to meet Veerle Janssens, one of her fellow examiners, at a PhD defense in Leuven – the PP2A expert urgently needed to get the project going! To tackle the initial CoIP problem, we directly set up a “PhD student exchange” - allowing me to stay in Leuven for a few weeks and quickly get to know PP2A. Together, we were able to show that SAMHD1 specifically interacts with PP2A-B55α holoenzymes and that these PP2A trimers are able to remove T592 phosphorylation in vitro. Additionally, chemical inhibition or silencing of PP2A by siRNA led to an increase in SAMHD1 pT592-levels – further supporting PP2A’s involvement in SAMHD1 regulation in the cellular context. We could even show that PP2A-B55α holoenzymes target and dephosphorylate SAMHD1 at T592 in cycling cells during a brief time window at the end of mitosis, the so-called mitotic exit (within only approx. 20 min). Regulation of SAMHD1 T592 (de)phosphorylation during cell cycle-progression. Actually, SAMHD1 is dephosphorylated at T592 each time cycling cells re-enter interphase after mitosis. As a result, we were wondering whether SAMHD1 was able to reduce HIV-1 infection in the G1 stage. Would SAMHD1 be active against HIV-1 – even in cycling cells? Therefore, we infected – instead of a bulk of cycling cells – synchronized HeLa as well as (activated) primary CD4+ T cells at different cell cycle-stages displaying differing SAMHD1 pT592-levels. Indeed, we could observe a reduction of RT products upon G1 entry, compared to cells infected in S to G2/M phase, which was dependent on the presence of SAMHD1 dephosphorylated at T592. Our observations could implicate that HIV-1 replication could be, at least, slowed down in G1 phase of activated CD4+ T cells – the primary targets for HIV-1 infection. But how does T592 phosphorylation control SAMHD1’s antiviral activity? 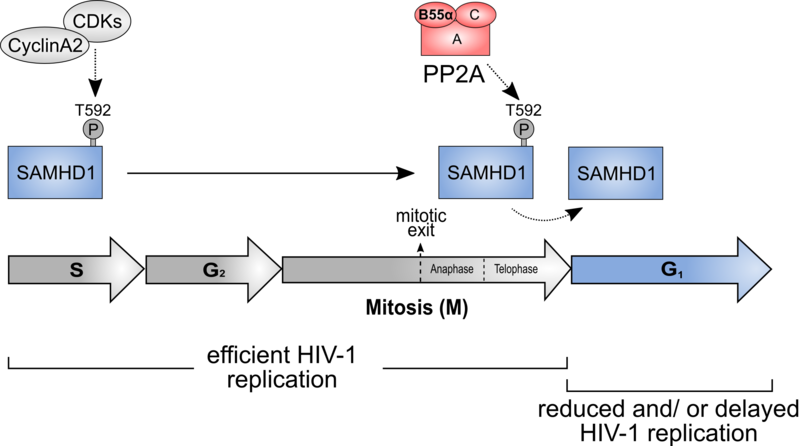 Is SAMHD1’s dNTPase activity, for instance, modulated by T592 phosphorylation? Or other (potentially, yet to be characterized) functions that could contribute to HIV-1 restriction? The conundrum still remains; therefore, further experiments are urgently needed to clarify the exact mechanism. Nevertheless, our study reinforces that SAMHD1 T592 phosphorylation is (and has to be) strictly controlled to allow for its proper function during diverse cellular processes, like DNA damage signaling as shown recently3, and for HIV-1 restriction. White, T. E. et al. The retroviral restriction ability of SAMHD1, but not its deoxynucleotide triphosphohydrolase activity, is regulated by phosphorylation. Cell Host Microbe 13, 441–451 (2013). Cribier, A., Descours, B., Valadao, A. L. C., Laguette, N. & Benkirane, M. Phosphorylation of SAMHD1 by cyclin A2/CDK1 regulates its restriction activity toward HIV-1. Cell Rep. 3, 1036–1043 (2013). Coquel, F. et al. SAMHD1 acts at stalled replication forks to prevent interferon induction. Nature (2018).